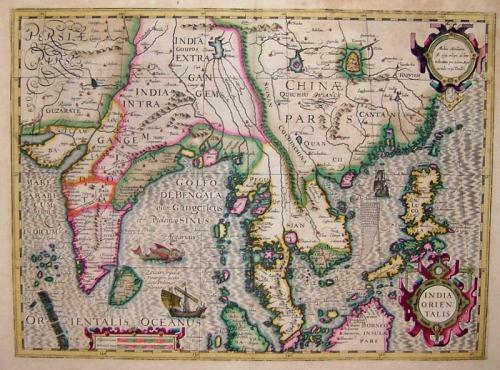 Title: 'India Orientalis' printed in Duisberg 1587. Gerard Mercator's attractive map of the East Indies with Latin text on the verso. A very decorative map of the Far East, embellished with three strapwork cartouches, ships and a sea-monster. The map is in very good condition with wide margins. There are some small taped repairs to some tears in the margin and two small chips. Slight browning but strong colours and overall very presentable.